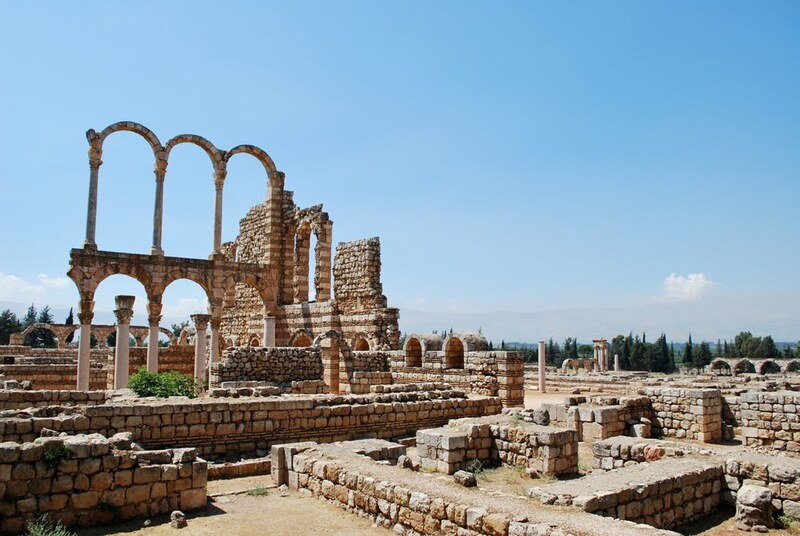 AN UMAYYAD SITE OF LEBANON Aanjar, 58 kilometers from Beirut, is completely different from any other archaeological experience you will have in Lebanon. At other historical sites in the country, different epochs and civilizations are superimposed one on top of the other. Aanjar is exclusively one period, the Umayyad. 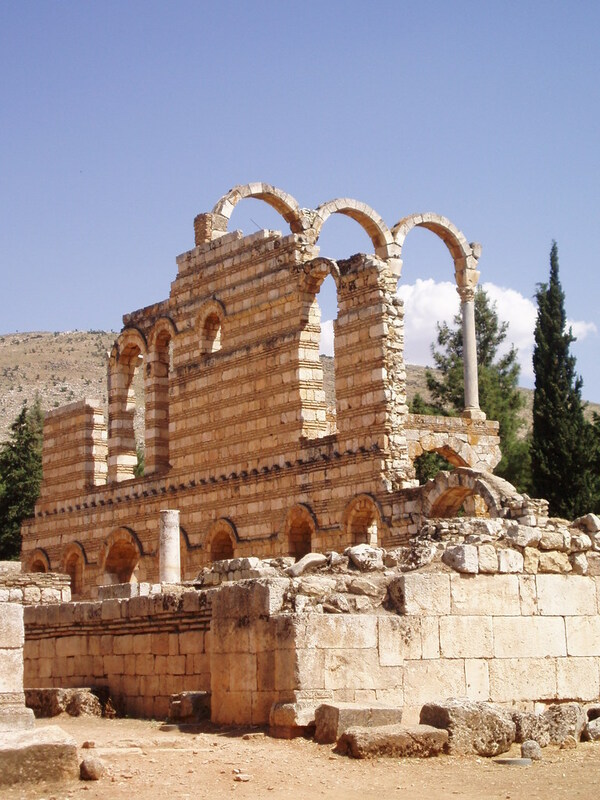 Lebanon’s other sites were founded millennia ago, but Aanjar is a relative new comer, going back to the early 8th century A.D. Unlike Tyre and Byblos, which claim continuous habitation since the day they were founded, Aanjar flourished for only a few decades. Other than a Small Umayyad mosque in Baalbek, we have few other remnants from this period of Arab history. Aanjar also stands unique as the only historic example of an inland commercial center. The city benefited from its strategic position on intersecting trade routes leading to Damascus, Homs, Baalbeck and the south. 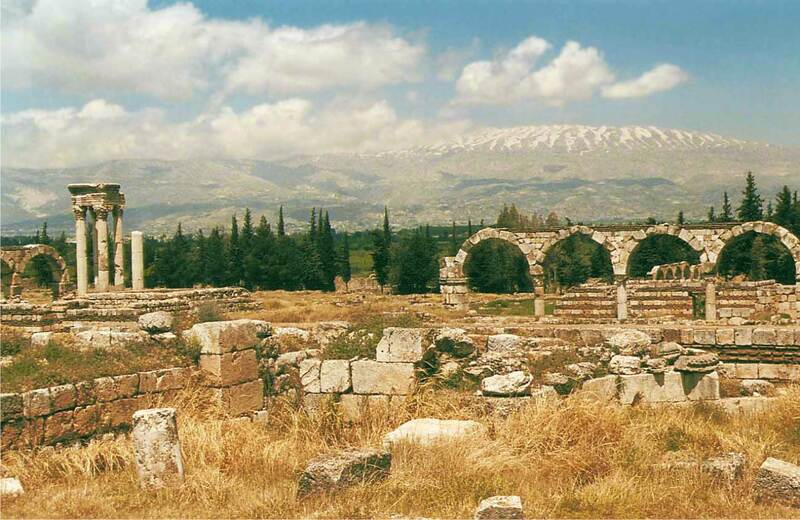 This almost perfect quadrilateral of ruins lies in the midst of some of the richest agricultural land in Lebanon. It is a short distance from gushing springs and one of the important sources of the Litani River. Today’s name, Aanjar, comes from the Arabic Ain Gerrha, “the source of Gerraha,” the name of an ancient city founded in this area during Hellenistic times. Aanjar has an especial beauty. The city’s slender columns and fragile arches stand to the massive bulk of the nearby Anti – Lebanon Mountains an eerie background for Aanjar’s extensive ruins and the memories of its short but energetic moment in history. The Umayyads, the first hereditary dynasty of Islam, ruled from Damascus in the first century after the prophet Mohammed, from 660 to 750 A.D. they are credited with the great Arab conquests that created an Islamic empire stretching from the Indus Valley to southern France. Skilled in administration and planning, their empire prospered for 100 years. Defeat befell them when the Abbasids their rivals and their successors took advantage of the Umayyad’s increasing decadence. Some chronicles and literary documents inform us that it was Wallid I, son of Caliph Abd al-Malik ibn Marwan II in a battle two kilometers from the city probably between 705 and 715 A.D.
Walid’s son Ibrahim lost Aanjar when he was defeated by his cousin Marwan II in a battle two kilometers from the city. Just after Lebanon gained independence in 1943, the country’s General of Antiquities began to investigate a strip of land in the Beqaa Valley sandwiched between the Lebanon and Anti Lebanon mountains some 58 kilometers east of Beirut. This was Aanjar, then a stretch of bland bareness with parched shruberry and stagnant swamps that covered the vast area of these archaeological; remains. The site at first seemed painfully modest, especially when compared with the rest of Lebanon’s archaeological wonders. What attracted the antiquities experts to Aanjar were not so much the ruins themselves as the information they held. Beneath the impersonal grayness of Aanjar, the experts suggested, lay the vestiges of the 8th century Umayyad dynasty that ruled from Damascus and held sway over an empire. That idea was particularly interesting because Lebanon that unique crossroads of the ages boasted ample archaeological evidence of almost all stages of Arab history with the exception of the Umayyad. Early in the excavation engineers drained the swamp. Stands of evergreen cypresses and eucalyptus trees plated and flourish today, giving these stately ruins a park like setting. To date, almost the entire site has been excavated and some monuments have been restored. Among the chief structures are the Palace I and the Mosque in the south east quarter, the residential area in the south west, the Palace II in the northwest and the Palace III and public bath in the northeast. To sense the vastness of the city, drive around the outside of the fortified enclosures (9) before entering the 114,000 square meters site. The north-south walls run 370 meters and the east-west sides extend 310 meters. The walls are two meters thick and built from a core of mud and rubble with an exterior facing of sizeable blocks and an interior facing of smaller layers of blocks. Against of the interior of the enclosures are the three stairways built on each side. They gave access to the top of the walls where guards circulated and protected the town. Each wall has an imposing gate, and towers (40 in all) are sited on each stretch of wall. The Umayyad’s hundred year history is steeped in war and conquest. Apparently their rulers felt that this wall and tower defenses were a necessary feature of their architecture. Nearly 60 inscriptions and graffiti from Umayyad times are scattered of the city’s surrounding walls. One of them, dated 123 of the Hegira (741 A.D.), is located on the western wall between the fourth and fifth tower from the south west. Today visitors enter through the northern gate of the site but as the main points of interest are at the southern half of the city, its better to walk up the main street (6) to the far end to the site. You are walking alone the 20 meter wide Cardo Maximus (a Latin term meaning a major street running north and south) which is flanked by shops, some of winch have been reconstructed. At the half way point of this commercial street a second major street (7) called Decumanus Maximus (running east to west) cuts across it at right angles. It is also flanked by shops. In all 600 shops have been uncovered, giving Aanjar the right to call itself a major Umayyad strip mall. The masonry work, of Byzantine origin, consists of courses of cut stone alternating with courses of brick. 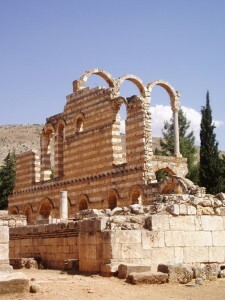 This technique credited to the Byzantines, reduced the effects of earthquakes. The tidy division of the site into four quarters is based on earlier Roman city planning. 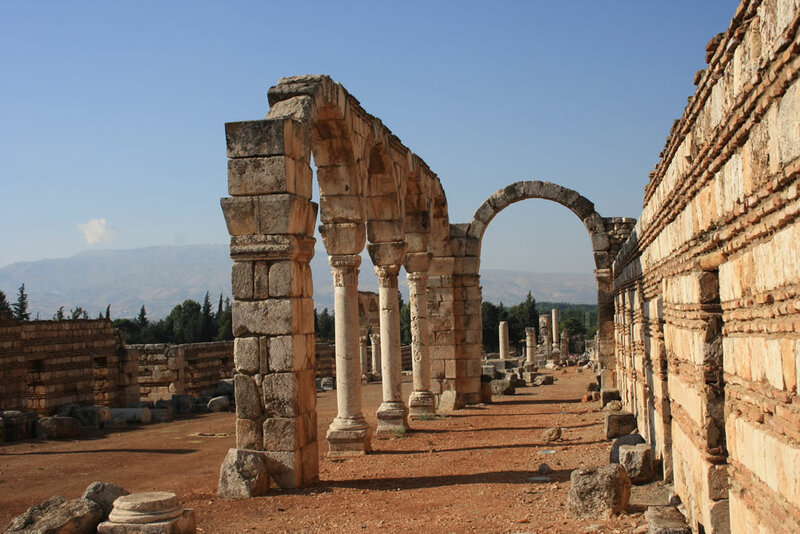 At the city’s crossroads you will have your first hint that the Umayyad was great recyclers. Tetra pylons mark the four corners of the intersection. This configuration called a tetra style (8) is remarkably reminiscent of Roman architecture. One of the tetra pylons have been reconstructed with it full quota of four columns. Note the Greek inscription at the bases and the Corinthian capitals with their characteristics carved acanthus leaves delightful to look at but definitely not original to the Umayyad. A city with 600 shops and an overwhelming concern for security must have required a fair number of people. Keeping this in king, archaeologists looked for remains of an extensive residential area and found it just beyond the tetra style to the southwest (5). However, these residential quarters received the least attention from archaeologists and need further excavation. A long both sides of the street you will see evenly spaced column bases and mostly fallen columns that were once part of an arcade that ran the ;eight of the street. Enough of these have been reconstructed to all your imagination finish the job. The columns of the arcade are by no means homogeneous; they differ in type and size and are crowned by varying capitals. Most of them are Byzantine, more indication that the Umayyad helped them to Byzantine and other ruins scattered around the area. On your way to the arcade palace ahead, notices the numerous slabs of stone that cover the top of what was the city’s drainage and sewage system. These manholes are convincing evidence of the city’s well-planned infrastructure. The great or main palace itself (1) was the fist landmark to emerge in 1949 when Aanjar was discovered. One wall and several arcades of the southern half of the palace have been reconstructed. As you stand in the 40 square meter open courtyard, it is picture the palace towering around you on all four sides. Just to the north of the palace are the sparse remains of a mosque (2) measuring 42 X 32 meters. The mosque had two public entrances and a private one for the caliph. If you enjoy a good game of archaeological hide and seek, the second palace (3) is the place for you. It is decorated with much finer and more intricate engravings, rich in motifs borrowed from the Greco Roman tradition. Very little reconstruction has been done to this palace so its floors and grounds are in their natural state. With patience you will find some stone carvings of delightful owls, eagles, seashells and the famous acanthus leaves. More evidence of the Umayyad’ dependence on the architectural traditions of other cultures appears some 20 meters north of this second palace. These Umayyad baths contain the three classical sections of the Roman bath: the bestiary where patrons changed clothing before their bath and rested afterwards, and three rooms for cold, warm and hot water. The size of the bestiary indicates the bath was more than source of physical of well being but also a center for social interaction. A second, smaller, bath of similar design is marked on the map (4). Aanjar is one daily. Close to the ruins of Aanjar are a number of restaurants which offer fresh trout plus a full array of Lebanese and Armenian dishes. Some restaurants are literally built over the trout ponds. Aanjar has no hotels lodging can be found in Chtaura 15 kilometers away. Ain Gerrha. Aanjars’s major spring is located 3 kilometers northeast of the ruins. Kfar Zabad. Roman temple ruins and a cave with stalactites and stalagmites. Special equipment needed for the cave.